I am making an effort to reduce my stuff and know the story behind the products I consume. Listening to an episode of the Pure Green Podcast, I realised I haven’t given that much thought to the products I use on my body and hair. I have been trying to use items that are vegan/not tested on animals and I really like the organic, mostly vegan and affordable line of dm, alverde. Being abroad and living only with a fraction of the things you own has many advantages, one of them being that you can that much easier assess what you really need and use. My hair and especially my skin don’t really fall in the soft and smooth and easy to handle category. I am definitely not an expert in applying makeup, so when I found things that worked for me I sticked with them. Living abroad also makes me use some products I wouldn’t at home, namely the shower gel and shampoo (I use natural products in Austria). Going through this (certainly limited) list of products, I see that most of them aren’t really organic/natural. A little investigation is in order. I did my best to find out whether the products are organic, vegan and/or cruelty free, but it’s not always possible because companies sometimes don’t allow investigation from NGOs. When not particularly mentioned, the product is not organic and not vegan. 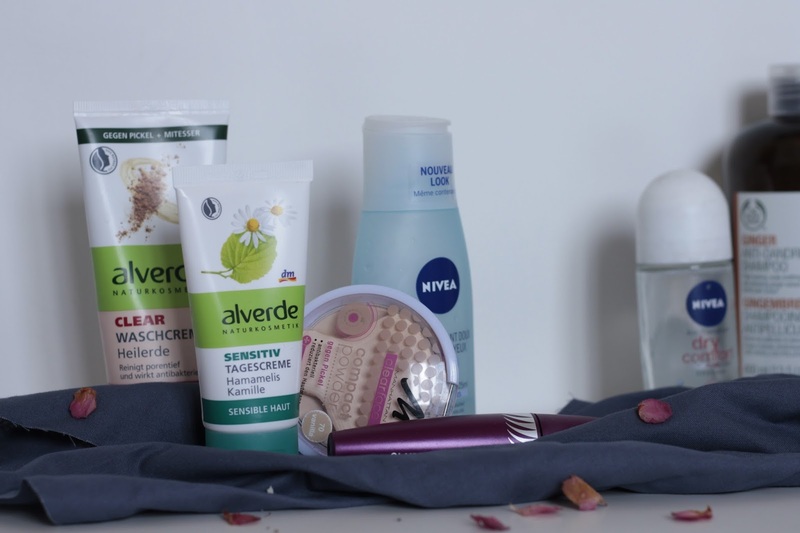 Moisturizer: alverde Senisitv Tagescreme … vegan: yes. cruelty free: yes. ingredients: 58. Powder: Manhattan clearface compact powder … cruelty free: not entirely. ingredients: 21. Mascara: Max Factor Clump Defy … cruelty free: no. ingredients: 16. Eye make-up remover: Nivea … cruelty free: probably not (they sell to China – see below). ingredients: 17. Make-up remover: alverde clear Waschcreme … vegan: yes. cruelty free: yes. ingredients: 28. Shower gel: l’occitane almond shower oil … cruelty free: not entirely (they sell to China which requests animal testing). ingredients: ?? hopefully almond oil. The problem with almonds though: the large proportion is grown in California using lots of pesticides… watch the documentary More Than Honey. Deodorant: Nivea Dry Comfort … cruelty free: probably not (see above). ingredients: 21 (including aluminium!). Shampoo: Body Shop Ginger Scalpcare … vegan: no. organic: they say yes, but there’s no certificate on the bottle. cruelty free: yes. ingredients: 25 (have a look at the ingredient list, they explain the function of each!). Body Shop is part of L’Oreal. Toothpaste: elmex Kariesschutz … part of Colgate-Palmolive. cruelty free: not yet (?). ingredients: 11. What have I learned from this research? That I use products that are tested on animals. That most of it isn’t natural/organic either (and I’d really like it to be considering that’s the stuff I put on my skin everyday). That I don’t recognize most of the ingredients. That a long ingredient list doesn’t have to be bad; looking at the ingredients of my alverde products I find that many of them are different fruit extracts, though I still ask myself how necessary they are. That it’s important to question everything (I have never ever thought about that aspect of my toothpaste, yet I have been using all my life). I want to try some natural and basic alternatives in the next few weeks (coconut oil, apple cider vinegar, baking soda, etc.) and report back here. It seems like such an easy and cheap option, let’s see if it’s also effective. I hope this has been useful to you (it certainly was for me!). If you have any corrections, advice and/or experiences with natural alternatives, I’d love to know!